After a brief ride atop a converted Soviet-era ballistic missile, a $187 million European satellite arrived in orbit Thursday to spend more than three years measuring Earth's eroding polar ice caps. Scientists expect the CryoSat 2 satellite will not only determine the rate ice is melting, but also provide clues on how the changes will affect Earth's fickle climate and sea levels. "The cost of flying a mission like CryoSat is nothing compared to the cost of not knowing what will happen," said Duncan Wingham, the mission's lead investigator. 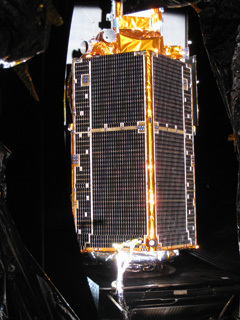 The European Space Agency approved CryoSat 2 in early 2006, just a few months after a similar satellite fell victim to a rocket failure during launch. ESA switched from the Rockot vehicle, another modified Soviet missile, to the Dnepr rocket for CryoSat 2. "It's one additional mission of ESA in orbit, and I must say that this time the launcher worked beautifully," said Jean-Jacques Dordain, ESA's director general. "I would like like to thank Kosmotras and the Russian authorities. It's a very strange launcher, but it works and we're in orbit." A Dnepr rocket flew out of an underground missile silo and lit its main engine at 1357 GMT (9:57 a.m. EDT) Thursday, beginning a journey south from the Baikonur Cosmodrome in Kazakhstan bound for a 445-mile-high polar orbit. 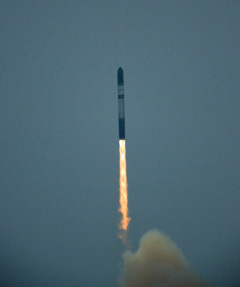 Flying backward to increase its injection accuracy, the rocket deployed the 1,587-pound satellite about 16 minutes later. A ground station in Kenya detected the first radio signals from the spacecraft moments later, confirming CryoSat 2 survived the fiery trip into space. 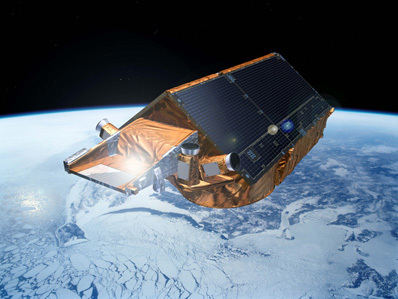 The CryoSat 2 satellite carries dual radars to measure the thickness of land and sea ice during the mission. Designed to pierce clouds and see through darkness, the instruments will determine ice elevation with a precision of about one centimeter, or a half-inch, according to ESA. "We know from our radar satellites that sea ice extent is diminishing, but there is still an urgent need to understand how the volume of ice is changing," said Volker Liebig, ESA's director of Earth observation programs. "To make these calculations, scientists also need information on ice thickness, which is exactly what our new CryoSat satellite will provide. We are now very much looking forward to receiving the first data from the mission." The SIRAL radars could be activated Sunday to collect the first bits of test data. But it will be six months before engineers give researchers the go-ahead to start science operations. Wingham said the satellite will be the first to measure the thickness and mass of both land and sea ice near the Earth's poles. CryoSat 2 will have two principal targets during its mission, according to Wingham. "The first is to examine closely just how much mass is being lost out of the Arctic Ocean due to the ongoing melt," Wingham said. "Although NASA has done a very fine job of mapping what the aerial retreat has been, there's no simple way of converting area to mass. One of the primary objectives of CryoSat is to determine what the mass loss is, rather than the aerial loss." Wingham, a professor at University College London, said CryoSat 2's measurements of sea ice in the Arctic Ocean will help researchers determine how melting ice sheets will impact climate. Parts of the ocean left exposed by melted sea ice are subject to winds and currents that could alter regional weather patterns that drive global climate. Ice caps on Antarctica and Greenland are also targets for CryoSat 2. "In the last five years, we have seen very dramatic changes in these ice masses, particularly at their margins," Wingham said. "We don't understand the cause or effects of these changes very well. We have to keep learning about them, and CryoSat will take up that cause." Land ice can be up to several miles thick, enough mass to trigger a significant rise in sea level if the sheets melted. Some fear the rising sea level could inundate coastal regions around the world. "The implications of sea level rise are felt globally," Wingham said. 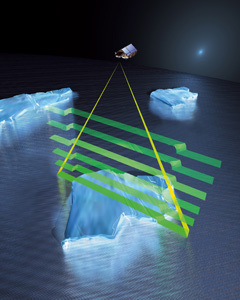 NASA's ICESat spacecraft used a laser instrument to precisely chart the diminishing aerial coverage of the ice caps between 2003 and 2009. The laser failed last year, and NASA is now retiring the satellite. Lasers provide more accurate measurements, while radars have better image contrast and work in all weather conditions, according to Wingham. "CryoSat is now going to pick up the measurement responsbility that ICESat was achieving," Wingham said. NASA plans to launch a follow-on satellite called ICESat 2 in 2014. In the meantime, the space agency is mounting a series of airborne observation campaigns to fill the gap in laser data. Operation Ice Bridge is focusing on coastal Greenland, coastal and interior Antarctica, the southeast Alaskan glaciers, and Antarctic and Arctic sea ice thicknesses, according to NASA. But airplane-based research is more limited than satellite observations. Wingham originally proposed the CryoSat mission more than a decade ago, and the project finally got off the launch pad in October 2005. But minutes after liftoff, a mishap with the Rockot launch vehicle doomed the mission and the satellite crashed into the Arctic Ocean. Scientists immediately began lobbying for a replacement satellite. Thanks to a consensus among researchers and politicians on the mission's importance, CryoSat 2 was approved just four months after its predecessor met its untimely demise. "We had this mission that was completely justified and deserving, so there was great goodwill among the upper echelons of ESA to rebuild it," said Richard Francis, CryoSat 2's project manager. Francis said officials made 86 changes to the spacecraft design, adding a second SIRAL radar for redundancy, putting in an updated communications system, increasing the size of the flight batteries, and revamping the satellite's software. "Our challenge was to develop and produce two high-precision SIRAL instruments for this CryoSat mission," said Laurent Rey, SIRAL project manager at Thales Alenia Space. "This type of instrument demands an extensive effort to deliver the required performance. The adjustments needed are extremely delicate, and doing this successfully depends on real technological prowess." CryoSat 2 was manufactured by EADS Astrium. Built by Thales Alenia Space, the SIRAL radars are based on microwave sensors designed to study sea surface topography on the TOPEX/Poseidon and Jason satellites. "Thanks to SIRAL, scientists will be able to combine data on the size of polar ice sheets with elevation measurements," Rey said. "This will enable them to study not only the current state of this natural environment, but also how fast it is changing globally. The data gathered will give us additional information to help us better understand the Earth's climate." SIRAL will operate in three modes. A low-resolution mode will scan the sea surface and stable continental ice sheets in Antactica, while synthetic aperture radar mode will measure the elevation of floating sea ice to determine its thickness. SIRAL's most advanced technique will use inferometry to gather the highest resolution data on the borders of ice sheets, which are usually the most active regions in the cryosphere. Using a second antenna and rapid radar pulses, the inferometry mode will reveal the ever-changing topography around the edges of ice caps. CryoSat 2 is the third of ESA's Earth Explorer missions, joining a soil moisture and ocean salinity satellite named SMOS and a gravity-mapping mission called GOCE. Both spacecraft were launched last year. "While SMOS measures the salinity, which helps to regulate the ocean circulation, CryoSat is also looking at the high latitudes and elements of the water cycle in terms of the way in which water is bound up in ice and snow in the ice sheets and sea ice," said Mark Drinkwater, an ESA scientist based in the Netherlands. "Meanwhile, we use the gravity data from GOCE to understand how we reference those data to the actual gravity of the Earth," Drinkwater said in a November interview. The next Earth Explorer launched will be Swarm, which features a constellation of three small satellites sent into orbit on the same rocket. Swarm will measure Earth's magnetic field after its launch in 2011.